We have five preseason Week 2 games on tap on Friday night, and while the slate isn’t quite as full as the 12-game opener we had last week, there’s still plenty analyze for DFS and fantasy football purposes. We won’t dance around: This piece will go over some of the top plays for Friday night DFS. Baker Mayfield is again expected to get significant playing time in this contest. He went 11-of-20 for 212 yards and two touchdowns in his debut. He’s definitely an option again in Week 2. Patrick Mahomes will play the first half of Kansas City’s game against the Falcons. This will no doubt make Mahomes one of the highest-owned quarterback on the slate, but when it comes to preseason DFS, there’s not much you can do to avoid high ownership. Mahomes was absurdly good in last year’s preseason, going 34-of-54 for 388 yards and four scores against no interceptions. He only played nine snaps last week, but he completed five of seven attempts. Mahomes needs to be on your short list. Josh Allen played 34 snaps in Buffalo’s Week 1 game, and with both AJ McCarron and Nathan Peterman nursing minor injuries sustained early in the week, it wouldn’t be a surprise to see Allen get a healthy amount of snaps again on Friday night. He completed nine of 19 passes for 116 yards, and his average depth of target was a predictably high 15.7 yards. If Theo Riddick does not play (check his status), then you have to like Kerryon Johnson again in Week 2. He led all running backs last week with 40 snaps, and while he had just seven attempts for 34 yards, the snap volume is extremely valuable in preseason. Johnson also ripped off a long run that was called back. That would have made his night a lot better and you’d be hearing a lot more about him. Nick Chubb is fully behind Carlos Hyde and Duke Johnson in Cleveland, but that’s not necessarily a bad thing for his preseason value. His 15 rushing attempts last week led all running backs. He gained just 11 yards, which is remarkably bad, but that level of potential volume is tough to find in the preseason, and volume is what I like to chase. With Kalen Ballage in the concussion protocol (check his status), and Kenyan Drake and Frank Gore unlikely to see much play, we could get a healthy dose of Senorise Perry on Friday night. Perry played just 11 snaps in the team’s first preseason game, but he made the most of those opportunities, gaining 35 yards and scoring a touchdown on four attempts. Cameron Artis-Payne had only five rushing attempts last week, but it was the most among all Carolina running backs. His 15 snaps were as many as Elijah Hood, Kenjon Barner, and Reggie Bonnafon saw combined. Antonio Callaway played 52 snaps in Cleveland’s first preseason game and caught three of seven targets for 87 yards and a score; he displayed his breakaway speed on his touchdown. No other Cleveland receiver saw more than 33 snaps, although that was apparently a “punishment” for the rookie. Even still, Callaway should be a regular contributor for the Browns this preseason. D.J. Moore played 34 snaps in Carolina’s first game and caught four of four targets for 75 yards. He also forced three missed tackles, which was more than any wideout in the first week of the preseason. 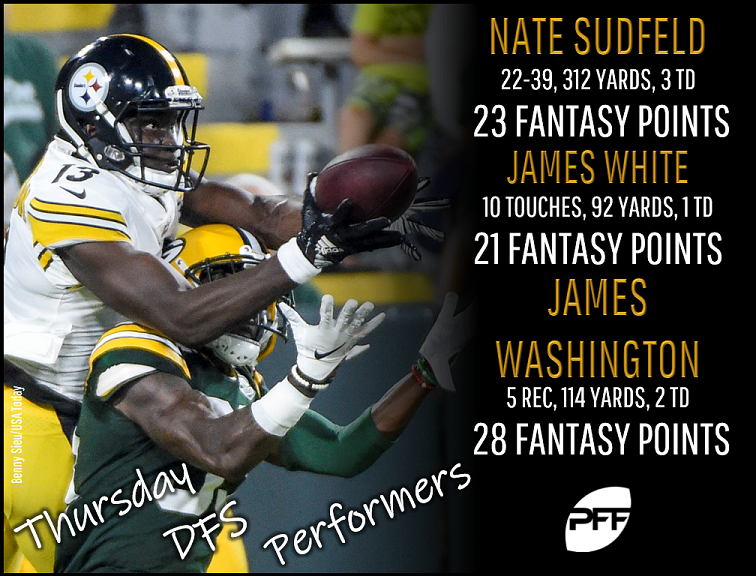 Moore played in both the first and second half of the game, and the healthy usage, combined with the playmaking ability, makes Moore a DFS option again this week. Miami’s Francis Owusu caught four of seven targets on just 20 snaps last week, which means he was the focal point of the play on an absurd 35 percent of his snaps. He had a long gain of 45 and totaled 82 receiving yards. He’s not a must-start for me, but I’m intrigued but that level of use. Atlanta’s Devin Gray had five targets, four receptions, and 83 yards last week — all of which were team-highs. In fact, all other Falcons receivers combined had 57 receiving yards. Players who flash early in the preseason can earn additional looks, and Gray fits the fill. Tre’Quan Smith played 46 snaps for the Saints last week. He caught four of five targets for 48 yards and was easily New Orleans’ best receiver in the game. Smith is in a similar boat as Gray: He’s a little-known player that was heavily utilized and made the most of his Week 1 preseason opportunities, which often translates into more opportunities as the preseason unfolds. David Njoku made the most of his two targets last week, translating them into 46 yards and two scores. He won’t see as many snaps or targets as some other tight ends on this slate, but his big-play ability and usage in the red zone makes him a legitimate option again in Week 2. All eyes were on Mike Gesicki, but Thomas Duarte out-snapped him 45-to-19 for the Dolphins last week. However, despite the difference in snaps, both players saw just two targets. Gesicki didn’t catch either of his, and it wouldn’t be a surprise to see the Dolphins try to get him going a bit in the second preseason game. Gesicki is my favorite of the two, but I think both are viable options on this short slate. Jerell Adams played 40 snaps (fourth-most) and saw five targets (tied for most) last week, so his usage is about as good as it gets in the preseason. He had just two catches for six yards, though, so he’s not exactly a big-play threat. Adams is a touchdown-or-bust player (as are most tight ends in the preseason). Kansas City’s Alex Ellis played 25 snaps and saw a position-high five targets last week. He caught four of them for 36 yards. The Chiefs actually dished it to their tight ends a lot last week: Kansas City tight ends saw 13 targets (31 percent of the total attempts).